Hiya everyone, Hope you are all doing well. 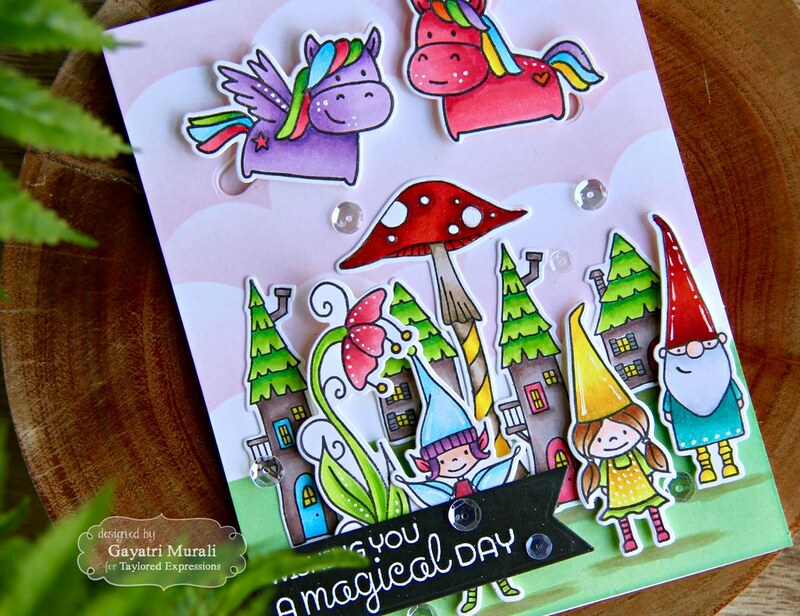 I have a card to share using Taylored Expressions stamp and dies. I was in a mood to create a scene. Not the scene you think! Lol! A magical scene. That is because there are a lot of unicorn, rainbows, holographic shiny stuff in the world of cosmetics and fashion. You can see it everywhere. So that is my inspiration for this card. 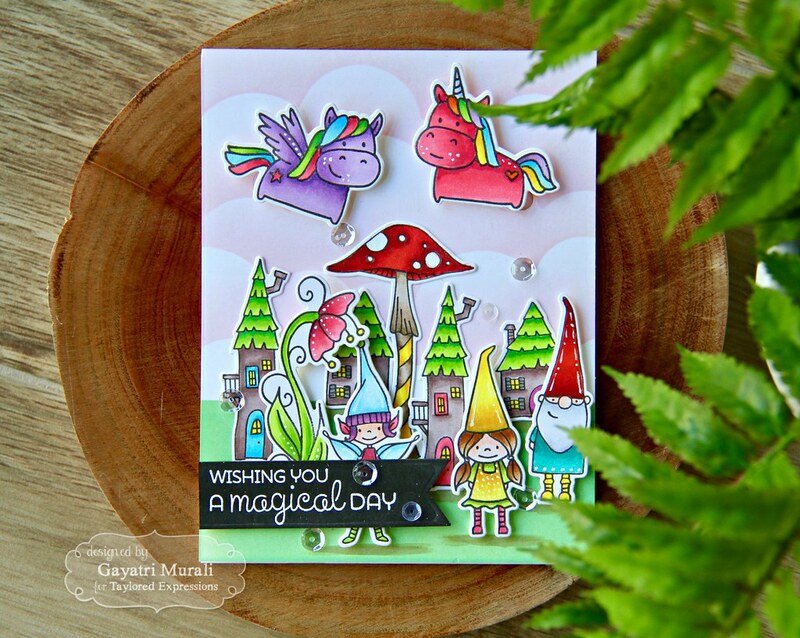 No rainbows and holographic shiny stuff on my card but certainly I created a magical scene. 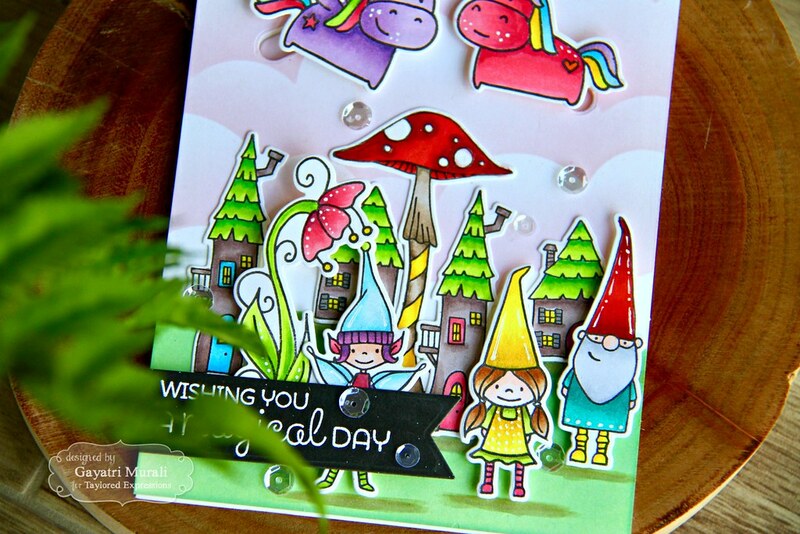 At least that is what I think so 🙂 On this card I have used TE Dreamer stamp and die combo, Under the Flower stamp and die combo and Under the Toadstool stamp set and coordinating dies. There is a rainbow cutting plate which I wanted to use but in the end I thought adding the rainbow will make the card cluttered. So I left it out. 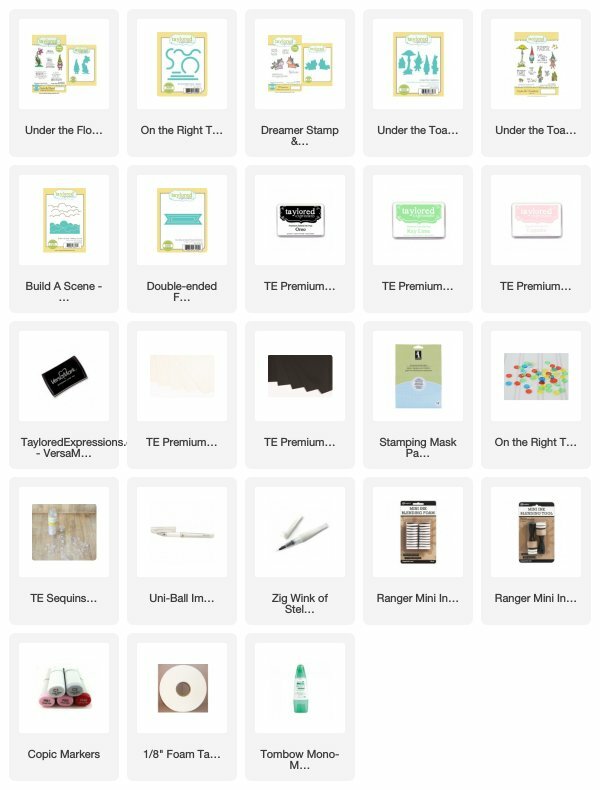 1.Card base is TE Sugar Cube cardstock. 2. On a Sugar Cube panel same size as the card front, I masked using Build a Scene Rolling Clouds die cut out of masking paper and sponged the sky using Cupcake TE dye ink. Instantly pink clouds makes the card magical. Don’t you think? 3. I masked the clouds and sponged the grass using Key Lime TE dye ink. This is a green with blue undertone. So pink clouds and blue undertoned green grass, not the typical colours used to make scenery. Hence making the background magical. 4. 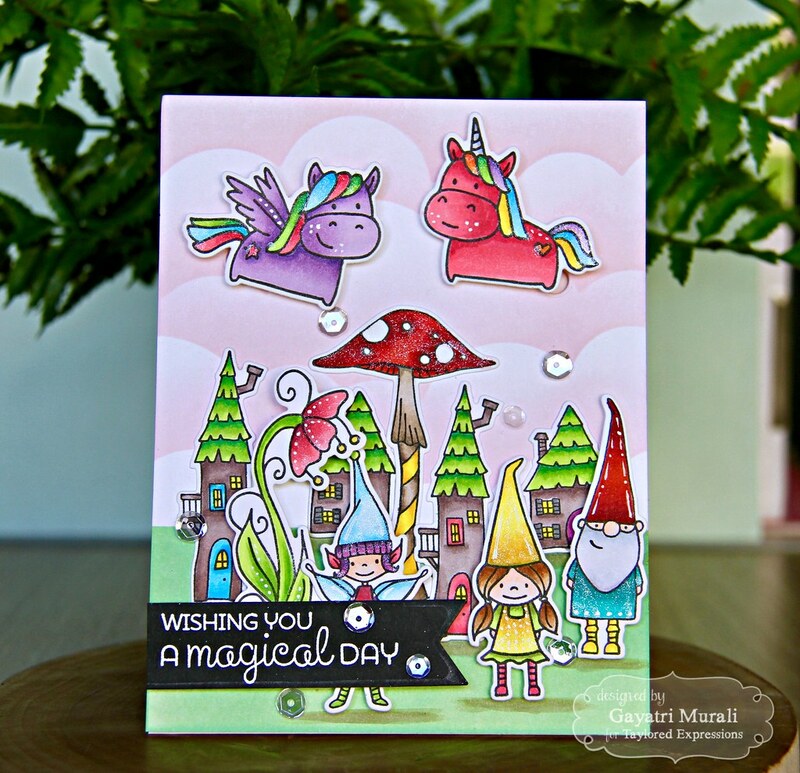 Now to add magical creatures, I stamped all the images from Under the Flower & Dreamer stamp and die combos and some of the images from Under the Toadstool stamp set using Oreo TE hybrid ink on Sugar Cube card panel and coloured them using copic markers. 6. On the top of the sponged background panel, I used the smallest track from On the Right Track Basics die to create slider tracks. I used the TE slider discs to create the sliders and adhered the panel on the card front using foam adhesives with the sliders in its place. 7. I adhered the two unicorn die cuts on the sliders. Rest of the image I adhered as shown. The furthest images I glued flush and the images closest using foam adhesives. This gives the depth to perception. I also grounded the images using copic markers. 8. The sentiment from Under the Toadstool stamp set is white heat embossed on Oreo strip fo cardstock and die cut using the second largest Double Ended Flag stacklet die. I adhered it on the bottom left of the card front. 9. To add to the shimmer, I adhered some sparkling sequins from TE Snow Flurries sequins collection. To add highlights to the coloured images, I used white gel pen. Where other than the magical world will you find fairy, oversized toadstool, gnomes or flying unicorns? Love love how this turned out. The interactive slider element makes it special as well. Hope you like it too. Thank you for visiting my blog today. Have a lovely week.